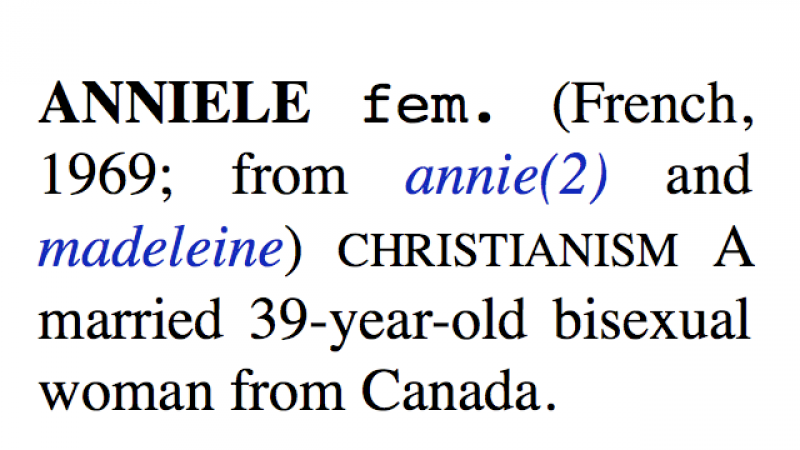 CHARACTERS is an interactive dictionary of given names and identities. It allows the visitor to participate by adding his own name and identity to the database. He can also create new names/identities through an evolutionary algorithm. This work came out of a series of questions I kept asking myself about how one's name relates to one's identity. What does a name tell about a person? Can a name influence the course of a life? How do names evolve through time? What differentiates names and nouns? The entire piece is based on a model of the social identity process where the name acts as some kind of genetic signature. When a visitor wants to add his name to the dictionary, the system asks him to fill out a form about his identity. The form compels the visitor to choose among a limited set of categories and traits, shaping his identity into a socially acceptable, standardized format. Getting back to the evolutionary analogy, if the name acts as the genetic code of the visitor, the traits that form his social definition would be his phenotype. By using artificial recombinations, mutations and crossovers through an evolutionary algorithm, the visitor can then create offspring of his own name or others': these offsprings' identity traits are recombined and mutated versions of their parents. These three categories of action represent the three different modalities of interactivity that are proposed by the work. The visitor can switch from one to another in a single click, at any time during his visit. An expert mode is also offered to the advanced visitor to control the evolution of identities, thus enabling a second level of interactivity that enables a better comprehension and finer tuning of the evolutionary algorithm.